Years ago already, I saw the idea on Pinterest to wrap a children’s book up each day to unwrap and read as part of the count-down to Christmas. The order doesn’t matter of the books because they are all focused on Christmas. I loved this idea of an Advent calendar with picture books! I knew that when we had children, I wanted to make this part of our Christmas traditions. Last year, Nathan was still too small but this year, I am going to make it happen! I’m a former preschool and elementary school teacher who loves to read so I have a lot of books. I’ve been collecting Christmas books for years! I started going through all my Christmas books and deciding which ones made the cut. Lots did but I’m adding some new ones to my collection this year as well. I had a simple criteria for my picture book Christmas count-down. I wanted all the books to be Christ-centered to help us stay focused on the true meaning of the season. I’m including a couple books that aren’t specifically Christ centered are focused on the Christmas season without too much fluff (ie the Nutracker and the 12 Days of Christmas). All these books have slightly different perspectives but stay true to the Biblical account of Jesus’ birth. Of the list that I am sharing, I have read every single one of these books. I own most of them. Several, I checked out from the library to see if they met my approval and added them to my Christmas wish list. I’m sharing this list and project now (in November) so that if you want to start this tradition with me, you have time to track down the books you want to use before December 1st is upon us. Your Christmas count-down will probably look different than mine – and that’s okay! 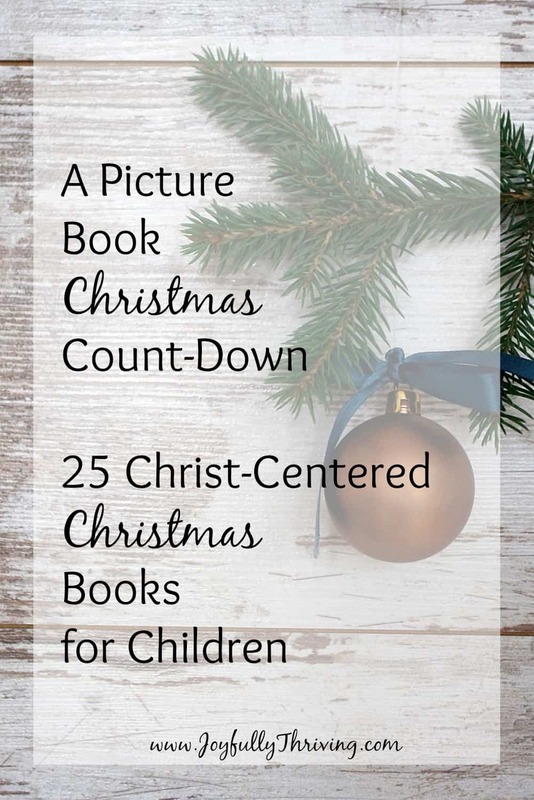 I’m sharing this list to give you ideas of quality, Christian children’s literature focused on Christ this Christmas. Start with the books that you already own and check out some from the library. See what sales or used copies you can track down on Amazon. Add some to your Christmas wish list. Maybe you will decide to surprise your children with a new Christmas book each year under the tree. This list can help with that as well! Maybe you’ve had hopes to do something similar but were overwhelmed with all the choices! I understand completely. I read a lot of Christmas books to chose ones of quality for my children – and for yours! I’ve included a list of the titles I will be using, as well as a short description of each. However you decide to use this list, I hope it will be helpful to you and your family! Here is my list of 25 Christ-centered Christmas books that we will be unwrapping and reading each day this Advent season. Who is Coming to Our House? by Joseph Slate tells of animals in the barn wondering who is coming to their house / stable. A Child Was Born: A First Nativity Book by Grace Maccarone is a very simple first nativity book telling of the first Christmas. The Legend of the Candy Cane by Lori Walburg tells how the candy cane can be used to teach about Jesus birth, life and resurrection. The Legend of the Christmas Cookie by Dandi Daley Mackall tells how European Christmas cookies began as another way to share the story of Jesus’ birth. This newer version appears to be the same as the Gift of the Christmas Cookie by the same author but with different illustrations. The Legend of the Christmas Tree by Pat Matuszak & Rick Osborne tells how the evergreen tree symbolizes Christmas and can tell others about Jesus. The Pine Tree Parable by Liz Curtis Higgs is a simpler Christmas tree story that tells of the sacrifices of Christmas. Each page includes a Bible verse that adds to the story. The Legend of the Poinsettia by Tomie dePaola is a Mexican legend of how the poinsettia came to be when a girl gave her unselfish gift to baby Jesus. The Story of the Nutcracker Ballet by Deborah Hautzig (while not about Jesus’ birthday) is a December classic with adorable illustrations in this version. There are countless other versions of the Nutcracker Ballet, too. Saint Nicholas: The Real Story of the Christmas Legend by Julie Stiegemeyer tells the true story of real life Christian Bishop Nicholas, whose generosity inspired others to give – all as a response to God’s gifts to us. The Manger Where Jesus Lay by Martha Larchar uses simple pictures and repetition to tell the Christmas story. The Newborn King by Cindy Robertson is the most Biblical accurate board book I have found that introduces young children to the true story of the first Christmas. Mortimer’s Christmas Manger by Karma Wilson is the story of a mouse who makes his home in the family’s nativity scene until he hears the story of whose home it really is. The Christmas Star by Moira Butterfield uses felt figure pictures to tell the Christmas story. This book continues all the way through the wise coming to little boy Jesus, which is rare to find in a Christmas children’s book! The Crippled Lamb by Max Lucado tells of a crippled lamb, Joshua, and reveals how God has a special plan for him – and us! God Gave Us Christmas by Lisa Tawn Bergren tells of a baby bear asking his mother who invented his Christmas. Mama bear leads him on an expedition to answer his questions and find God – who gave us the first Christmas. Itsy Bitsy Christmas by Max Lucado is written from the perspective of two tiny mice who wonder why a king would come to itsy bitsy Bethlehem for little ones like themselves. The First Christmas (The Birth of Jesus) by Mary Manz Simon is an early reader that clearly tells the Christmas story from Luke 2. Stable in Bethlehem: A Christmas Counting Book by Joy Hulme counts down from 12 drowsy doves to 7 soft sheep to 1 baby Savior to tell the Christmas story. Peek and Find Christmas Story by Allia Zobel-Nolan and Steve Cox has hidden pictures and cut-outs for your child to find as you read the Christmas story. Asleep in the Stable by Will Hillenbrand uses a baby Owl asking questions of his Mama to tell the Christmas story. I love how this book talks about both Jesus’ earthly father and his Heavenly Father. The Twelve Days of Christmas by Jan Brett is the traditional song of Christmas (even though it is really intended for the 12 days of Epiphany after Christmas). Like the Nutcracker, there are countless versions of this classic so find the one with pictures that you like most. Tonight You Are My Baby: Mary’s Christmas Gift by Jeannine Norris tells of Mary’s lullaby to Jesus on the night he is born, foreshadowing all he will do. The Very First Christmas by Paul Maier focuses on a detailed retelling of Luke 2. The Christmas Miracle of Jonathan Toomey by Susan Wojciechowski tells of a grumpy woodcarver who is changed by carving a new nativity for a widow and her son. This is a longer book that is perfect for older children. Mary’s First Christmas by Walter Wangerin, Jr. is a gorgeous story of Mary telling young boy Jesus the story of his birth. Again, it is a longer book that is perfect for a bit older children and adults alike. This is one of my all-time favorite Christmas books! There you have it! These are 25 of the Christ-centered Christmas books I will be reading with Nathan this Christmas. What Christmas books will you be reading with your children? I’d love to hear some of your favorites, as I’m sure this list will change and evolve over the years as we discover new favorites! Many of these are our family favorites that we try to read every year. #1 was our all time favorite book when they were toddlers. It was very sad for me to admit that they were all too old to read it a couple of years ago. I packed it away for my grandchildren. I highly recommend taking a break and reading together as a family during the busy days of December. You can also read together for the 12 days of Christmas from Christmas to Epiphany. We have so many books that we want to read that we can't fit them all in before Christmas. I would also add a version of Twas the Night Before Christmas-I think it is a classic that children should hear every year even though it is not Christian. After reading #9 we like that this poem calls him St. Nicholas. I'm glad you are saving your favorites for grandbabies! That's a great idea to continue reading through, Epiphany! There are so many wonderful Christmas books, but it's fun to know that some on my list match up with yours! Thanks for sharing these! We always read The Littlest Shepherd and The Best Christmas Pageant Ever at Christmas. I'm going to add a few of these to our wishlist for Layla! You're welcome, Kate! I actually added a couple of this to our wishlist for Nathan, too! I have others, but these books were my absolute favorites after I read through dozens and dozens. Thank you for these great suggestions! I do a new Christmas book for the girls each year (their "something to read" with our gifts of want, need, wear, read) so I will definitely be consulting this list in the future! You're so welcome, Lisa! I actually don't own all of these yet (although I've read all of them) so Nathan will be getting some of these over the next couple years. I love giving a special book each year, too!